Thirteen/WNET's Ready To Learn service provides parents, teachers and caregivers in New York's Tri-state area with public television resources that help children develop a lifelong love of learning. Thirteen builds partnerships with community organizations, childcare networks, schools, libraries, and government agencies. Broadcasts 8.5 hours of children's educational programming each weekday. Delivers educational messages between programs that build learning and social skills. Conducts training workshops and events to help parents, teachers, and caregivers use television as a positive force in children's lives through reading, music, hands-on activities, and active discussion. Collaborates with local child care providers, Even Start and Head Start programs, schools, libraries and museums to extend community based learning opportunities. Coordinates multimedia and multifaceted educational outreach events through the use of specific children's programming to help prepare children for the formal education system. Produces podcasts, videos, and narrated powerpoints to educate New York City parents on crucial topics in New York City children's education. 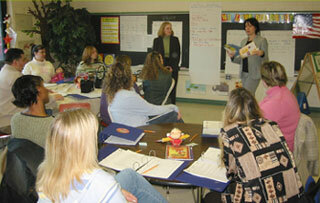 Advocates for and raises awareness of early care and education issues through conferences, workshops, and events. To learn more about Ready To Learn, visit PBS. Major support for Thirteen's Ready To Learn Service for caregivers and parents of pre-schoolers is made possible by the Sirus Foundation; with additional support from the Talaris Institute; Bloomingdale's Fund of the Federated Department Stores Foundation; Planet Dog Foundation; Banfield Charitable Trust; KCET; the New York City Department of Education's Office of Early Childhood Education; and the Corporation for Public Broadcasting. Watch this 60-second clip and get Ready To Learn. Ready To Learn is making an impact in local schools. Learn more. Thirteen's Ready To Learn service works with community-based organizations, childcare networks, Even Start and Head Start programs, and research institutions to extend learning opportunities. To learn more about Thirteen/WNET's Ready To Learn Service please contact our helpline at 212.560.2713 or email readytolearn@thirteen.org.